I'm Ann Martin, a quilling enthusiast who has been exploring the worlds of creative paper art and paper craft here at All Things Paper since 2009. Topics range from the latest on the craft scene - stylish paper-related DIYs, trends, and reviews - to interviews with established paper artists and emerging artisans with big ideas. A former hospital nurse, I live on the east coast of the United States in Delaware where I design paper projects for books and magazines. I love introducing the surprising concept of rolled paper art to those who have never seen or heard of quilling. A particular passion is creating quilled jewelry. 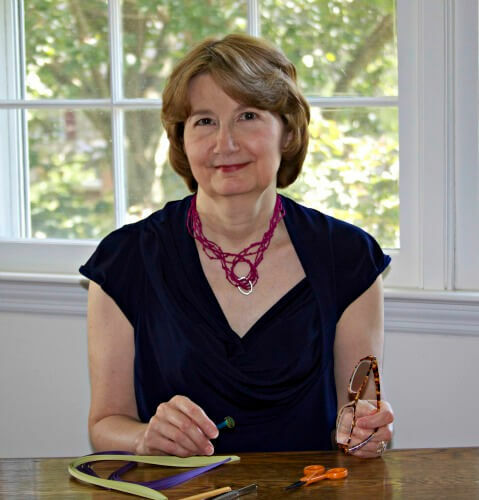 My newest book, The Art of Quilling Paper Jewelry, can be purchased in print format or as an eBook from Interweave Publishing. It is also available via Amazon, Barnes and Noble, Book Depository (free international shipping) or your favorite bookstore. My previous books, All Things Paper: 20 Unique Projects from Leading Paper Crafters, Artists, and Designers and Creative Paper Quilling: Wall Art, Jewelry, Cards & More, are in stores and libraries worldwide. I send out a newsletter every three weeks. If you would like to be introduced to a variety of intriguing paper art and paper crafts, sign up for it here. You'll find paper craft supplies I recommend in my Amazon shop.